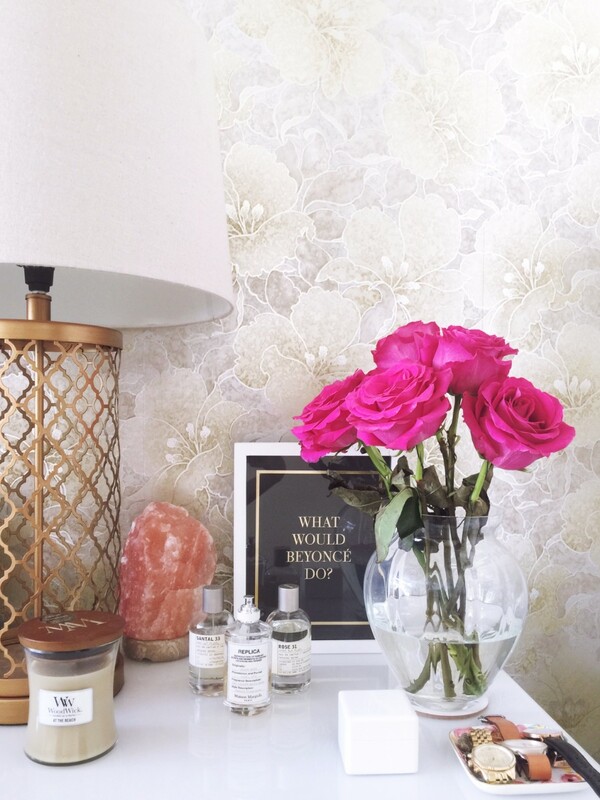 I love home decor ideas and wanted to share some tips on how to style your bedside table beautifully. As the first thing you see when you wake up and the last sight at night before you go to sleep every day, it’s definitely worth spending some time to create a stunning little space that reflects your style and includes a few things you love! This is my bedside table below. I like to keep it clean and organized, with a sprinkling of a few of my favorite things. Of course, fresh flowers always add a gorgeous touch and I have fun choosing a pretty bunch each week. It is so simple to add a little luxury to your life and your home – and your bedside table is the perfect place to start! 1. SIMPLICITY IS THE ULTIMATE FORM OF SOPHISTICATION. As they say, less is more and this is key to remember when styling your bedside table. Choose a few pieces you love and feel inspired by, the rest should be stored in drawers below to keep your surface clean, clear and uncluttered. When buying a bedside table, opt for one with great storage space (big drawers). This means you’ll have everything at your fingertips, but it will be neatly packed away. We have the from Malm 3 Drawer Chest from Ikea in the black / brown wood color and I added the Malm White Glass Top – they look fabulous together! Our bed is a king with a high headboard frame, so I feel a larger bedside table fits well and also accommodates our gorgeous oversized lamps. It’s very chic and has just the right amount of drama to create a luxe feel. 2. ADD DIMENSION AND DRAMA WITH HEIGHT. Styling with objects of varying heights creates interest and drama, this is key to styling a bedside table. A lamp is perfect as the tallest item, then graduate down from there by adding a photo frame, flowers or a candle. Then for the lowest item, a jewelry tray is brilliant. Your bedroom should be a relaxing space and to encourage restful sleep, including elements from nature can help promote this. In addition to fresh flowers, I personally love having a Himalayan Pink Salt Lamp beside our bed, these have become mega popular and are great to have in key rooms around your home. They can help cleanse and purify air, as well as give many other benefits by absorbing the positive ions in the air, which sap our bodies of energy. Himalayan Pink Salt Lamps generate negative ions naturally, when heated, the salt releases cleansed water vapor back into the air. I got my Himalayan Pink Salt Lamp on Amazon. As you’re adding pieces, think about what genuinely works well together. For a beautifully styled look, keep almost everything within a neutral color palette, then add a little pop of color with one statement piece. I love doing this with flowers! It’s fun to change them up each week and bring a new vibe to the space. Another great option includes a pretty bright jewelry box – these are practical and pretty! 5. HAVE FUN WITH ART AND INSPIRATION. Whether it’s a photograph of loved ones or fun quote art, be sure to bring your personality into this space. It’s a really fun opportunity to make an area in your home 100% completely YOU! Remember, you don’t have to spend a fortune to have gorgeous interior style and decorate your bedside table. I like to check out Target and Ikea for great basics, then dress them up with more personalized and creative items from Etsy. Or look for when big departments stores like Nordstrom or outlets like Century 21 (my favorite!). I hope this helps provide inspiration on how to style your bedside table, I’d love to hear your thoughts and what pieces you like to wake up and dream next to? Great post and beautiful decor! Right now my bedside table consists of tissues, baby wipes, allergy medications, and kids’ drinks for their middle of the night needs! Some day, I will have grown up decor! Your bedside table looks gorgeous! I definitely need to find a cute way to organise my watches like you! I love this post! It is new and original! Peace! Your bedside table is lovely. The perfect mix of clean but accessorized. I had never heard of Century 21, but I’m checking it out. Thanks for sharing and hosting! Happy Weekend!